A bathroom upgrade is one of the keys to modernising your home's appearance and increasing its overall value. k. A bathroom makeover will look great and maybe even change how you feel about your home. If you don't upgrade your bathroom it will stand out from the rest of your home. By upgrading your bathroom, you can introduce new importance to it. Our supply and installation company in london will be able to swiftly upgrade your bathroom suite. Advanced Professional Plumbing and Heating is a family owned and run bathroom installation company with a vision of offering a professional and friendly plumbing, heating, bathroom installation service. We personally take on each installation to make sure that the work commenced is to the highest standards possible. • Installation of showers whether gravity, power or electric. • Installation of downlights, extractor fans and shaver sockets. • Installation of mirrors with lights. • Installation of wet rooms. • Removal and disposal of your old bathroom suite. • Removal and disposal of your existing wall and floor tiles and coverings. • Plastering of your walls and ceilings including coving. 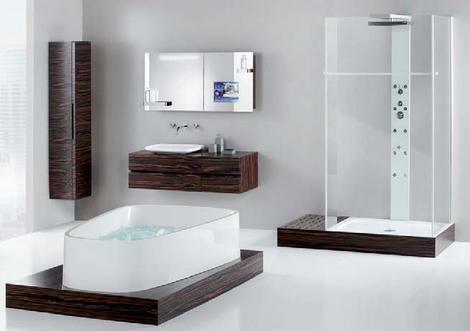 • Installation of your new bathroom suite including fitted furniture. • Installation of baths whether normal, whirlpool or spa. • Installation of shower enclosures whether normal, power or steam cubicles. • Full wall and floor tiling including heated floors. If you are interested or need any help with any of the services please always contact us on 02071667835, 07765329957. We are always here for you 24 hours a day 7 days a week also throughout all festive periods. If you are looking for a new fully fitted bathroom installation you have come to the right place! Your bathroom is one of the most important rooms of your house as it is a place when you can relax in a nice hot bath and forget about your worries so when deciding on a new bathroom design it is very important to take the ambience into consideration. Our team of bathroom designers and bathroom installers can handle bathroom designs or fitting whether it be a overhaul of your existing bathroom, a new en-suite installation or wet room. Priding ourselves on having a hand picked team of professional designers and fitters we can do the complete installation from start to finish. We offer the choice and freedom for you to choose your own sinks, suite, bath, shower, cabinets and accessories and we will help you with our experience to complete the bathroom design and then go on to plan the installation keeping our clients involved in every stage of the build so you can understand the process and feel comfortable of the work that Advanced Plumbing and Heating performs.